It's not impossible to like, but there are frequent barriers to enjoyment. Are this summer's blockbuster movie games any good? It’s easy to get excited about this weekend’s release of Mission: Impossible – Rogue Nation, especially after 2011’s Ghost Protocol pumped some life back into the spy film franchise. Just look at the latest trailer: The bike chase! That car chase! The gadgets! Tom Cruise hanging off of an airplane! It’ll be tough to top the last one, but Rogue Nation seems like it’s got a fighting chance. 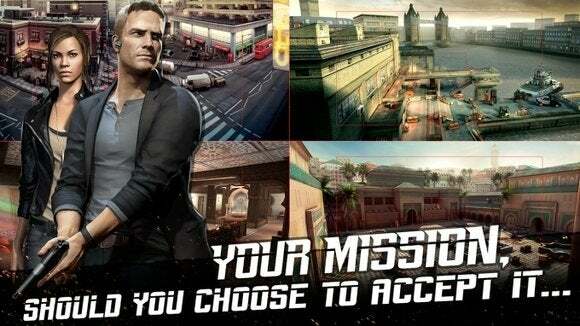 What about Mission Impossible: Rogue Nation (note the different colon placement), the iOS game? Sure, it has plenty of action: Shooting people, shooting objects, and… true, it’s mostly just shooting things. That’s well and fine, since it’s free and has solid production value, but it doesn’t really capture the feel and flair of the source material—plus it’s loaded with annoying freemium prompts and limitations. You’ll hide behind cover while reloading and evading gunfire, plus you can swap over to alternate spots in the stage. There’s a reason why the Rogue Nation game feels a lot more like a straight-up shooter than a spy adventure: It’s a barely disguised reskin of Glu’s existing Contract Killer: Sniper game, all the way from the menu design through to the mission objectives, interface, and gameplay elements. Even the levels are the same. No wonder it doesn’t come across like a natural extension of the rich and interesting Mission: Impossible brand. It doesn’t help that you don’t play as series star Ethan Hunt or even see him or his supporting agents: He’s referenced in text, but otherwise remains out of sight. Instead, you’re a rival agent recruited to take him out, but the thin storyline changes direction before long. It doesn’t even have the neat gadgetry seen in the films, aside from an automated helper drone. At least the classic theme song makes an appearance. Whether wielding a sniper or assault rife, using the scope or reticle is the key to accurate shots. So it’s not much of a Mission: Impossible game, but Rogue Nation is a competent enough cover-based shooter. In some missions, you’ll hide behind a faraway perch, popping out to pick off targets with your sniper rifle. 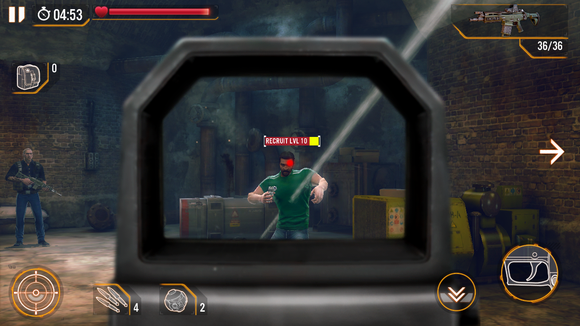 Other times, the goal is simply to eliminate all enemies in view while hiding behind crates and walls, using an assault rifle or other heavy weapon to pump lead into generic goons. Sometimes you’ll just need to cause a bunch of damage by shooting cars and crates—that’s when the spy premise really goes off the rails. 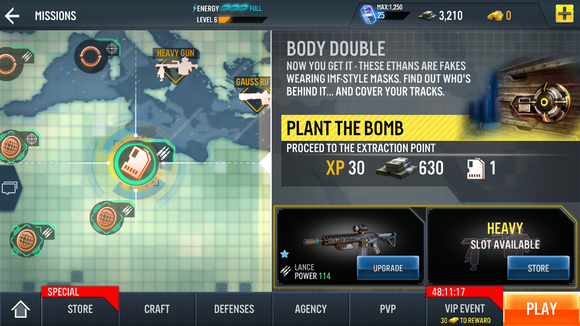 Stealth missions pop up occasionally, but by and large, Rogue Nation is all about aiming your gun and completing quick-hit missions as you pursue bad men across the planet. It all works well enough, but there’s little challenge and variety to the missions: the only things that change are the backdrop and your weapons, and it’s the latter point that drives the freemium grind. The map is peppered with missions to accept, but gun requirements often keep them just out of reach. Surprisingly, Rogue Nation isn’t very restrictive when it comes to playing for long stretches of time. It has an energy meter, but I’ve played 30-plus minutes in sessions and not run into any roadblocks. Perhaps later missions are much more difficult, making death more likely and zapping that meter in a hurry—but across the several early hours I played, it was never a problem. But while you can keep playing, Glu never lets you forget that Rogue Nation is a free-to-play game, and that profit trumps creativity or originality here. 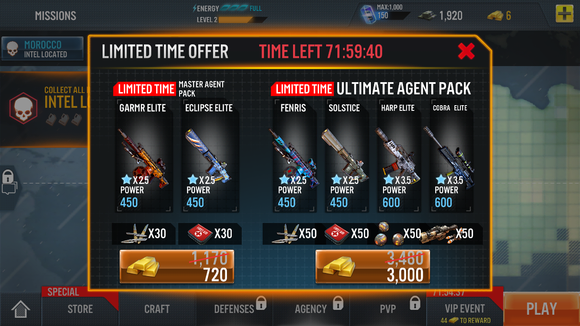 Frequent prompts appear with special offers: Bundles of guns that you can buy at a discount in this one-time offer, yet still are wildly expensive. Elsewhere, you’ll be prompted to watch video ads in exchange for items like bombs and throwing knives, the latter of which seem more or less essential to get through stealth missions. Watching a video ad also lets you double your earnings after missions, which I actually like: I’ll happily let a 20-30 second commercial run instead of another identical two-minute level. It’s true, you can watch a video ad for gold—but you’ll trade 20-30 seconds of your life for a single bar. And the packs are wildly expense. Where Rogue Nation proves more restrictive is in its weapon requirements. Each mission requires you to have a gun of a certain rating, which means you can either upgrade an existing gun to the prescribed level—or buy a new one outright. Both routes are either slow or expensive. 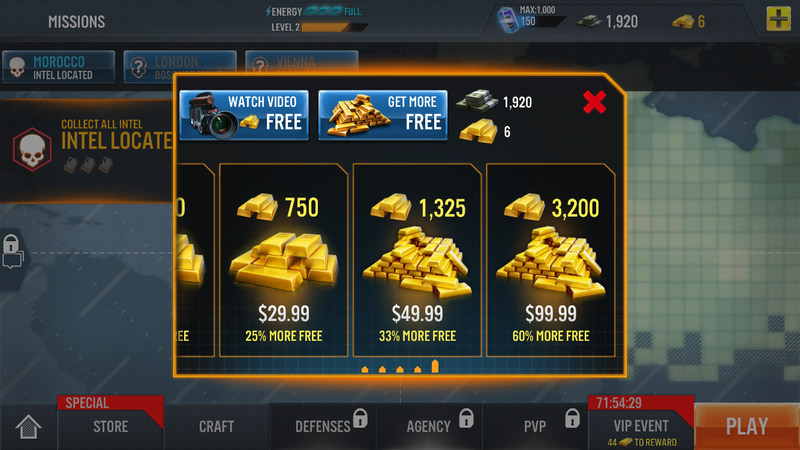 Glu keeps things confusing with three different currency types—earned cash, slowly-accumulated data crystals, and premium gold—but one thing is consistent: The weapons cost a hilarious amount of cash. That ultimate bundle on the right? The $100 gold pack just covers the expense. Seriously. Need a more powerful sniper rifle to take on a mission? It might cost you $15 or more in gold. That limited time offer of a discounted firearm two-pack? Nearly $20. The “deals” section in the store couldn’t be more incorrect, thanks to the presence of an Ultimate Agent Pack of high-end guns that costs almost $100 worth of gold. Will you still be playing Rogue Nation in a few months? Will it even still be in the App Store by the time 2016 rolls around? Don’t spend $100 on a freemium movie game, please. I implore you. 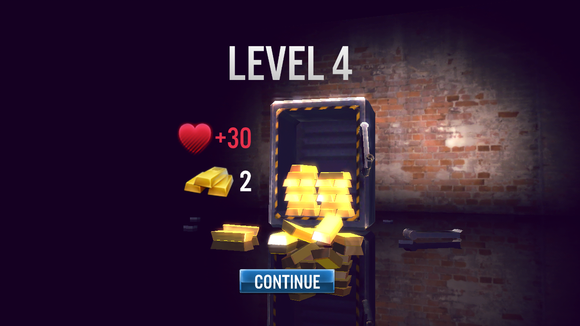 This is hilarious: when you level up, the safe’s door explodes to reveal loads of gold bricks… and you get two of them. Ultimately, I dropped $10 on a pack of gold to afford a handful of gun upgrades that eased some of the repetition—it allowed me to skip the common missions and go straight to those that earn intelligence, which is needed to push the campaign along. But the gold runs out quickly and the gun requirements only get more and more audacious as the game progresses. 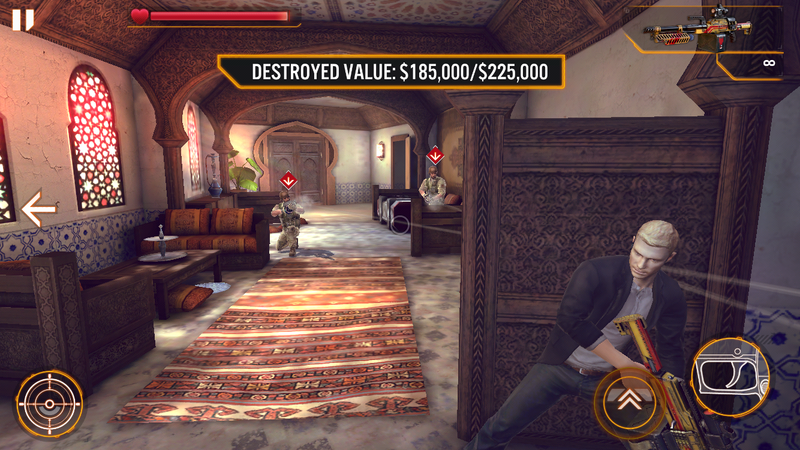 Like Contract Killer: Sniper, the bland game that Glu slapped this license upon, Mission Impossible: Rogue Nation is a competent, free action game that provides plenty of things to shoot. But beyond the theme song and the mention of the main character’s name, it doesn’t strive to capture the excitement or personality of the movies: It’s content to kill time and try to take your money (or ad revenue). As a free game, Rogue Nation gives a little—but it frequently asks for much more.